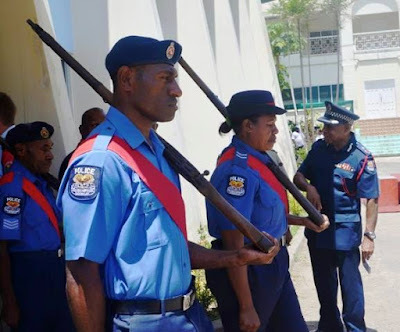 Acting Deputy Commissioner and Chief of Operations, Mr Jim Andrews has supported calls made by Prime Minister Peter O'Neill to weed out corrupt and undisciplined police officers. "We will be meticulously investigating all those cases and those implicated in such allegations will be dealt with accordingly," Mr Andrews said. He said, "Police brutality and discipline issues are issues only the police management can fix". and his senior management to come down and do their job," said Chief Andrews. "In the directive to all commanders are to deal with their men to address this serious problem of police brutality, corruption and lack of performance," Mr Andrews said. Deputy Commissioner Andrews said NCD is the worst offender with regards to police brutality and other related issues which are to be addressed forthwith. "NCD is PNG so once the problem is adequately addressed here the rest of the country will follow suit," Mr Andrews said. He said as a move to enforce discipline and command and control he will form a committee within the Internal Affairs Directorate to fix these problems. "I believed we also have a number of Notice of Penalties (NOP's) that was supposed to be served on members but have not been served, for various reasons. This committee will work with the Internal Affairs Directorate to find out the status of NOPs." NOPs that have not been served will be served and officers who have failed to have served NOP's within the expected time will be also dealt with," Deputy Commissioner Andrews said, adding that he was committed in the fight against corrupt and abusive officers.